Miss Universe 2015 Pia Alonzo Wurtzbach has been selected to judge the 66th annual Miss Universe Pageant to be televised on FOX on November 26 (Nov. 27 PH Time) at the AXIS at Planet Hollywood in Las Vegas, Nevada, the Miss Universe official Instagram announced on Wednesday. The 28-year-old Miss Universe Organization Ambassador will join other celebrity judges including Ross Matthews, Lele Pons, Jay Manuel, Megan Olivi, and Wendy Fitzwilliam. 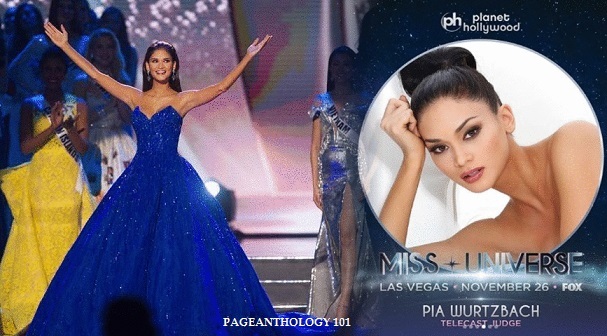 Pia will be the seventh Filipino to judge the Miss Universe Pageant after Gen. Carlos P. Romulo, Emilio Yap, Josie Cruz-Natori, Kuh Ledesma, Lea Salonga and Manny Pacquiao.